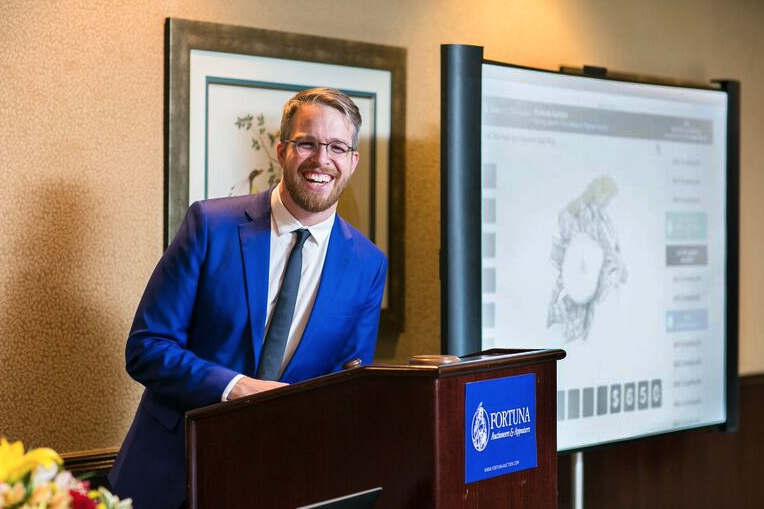 Today we feature CEO Seth Holehouse from Fortuna Auction, a New York-based Auction House specialized on Jewelry. Fortuna is an auction house that specializes in fine jewelry and gemstones. We began in 2012 and are based in New York City. In the world of auctions, we are fairly young—and that’s a good thing. Having a narrow focus on jewelry gives us an edge over traditional houses, especially in the internet age where the buying landscape is so fragmented. Our auctions are hosted 4-6 times a year. We have bidders live in the sale room, over the phones, and through online platforms from all over the world. I come from a background of industrial design and entered into the field of jewelry around a decade ago when I met my wife. She already had an established jewelry career as a Graduate Gemologist from GIA. Together we continued to learn how to buy and sell jewelry, and built a successful retail/wholesale establishment here in New York. One big reason we started Fortuna Auction was because we had an unfortunate experience with auction houses ourselves. A few years back, we were asked by a client to sell a piece of Chinese art, which falls outside our area of expertise. After we consigned the item at an auction—where it didn’t sell—we got hit with with thousands of dollars in auction fees. It was painful to learn how vulnerable people are when buying or selling in an unfamiliar area. We figured that many sellers and buyers of jewelry might be unaware of the potential risks, the nuances in the marketplace, or simply not be aware of all the sales channels available to them, so we founded Fortuna to alleviate that pain. In the last few years, it’s becoming ever clearer to me that there’s a tremendous need for a reliable, trusted way to buy and sell jewelry at fair market values. From the perspective of the seller, jewelry has such personal importance. It may have been handed down in the family and carries with it sentimental value. Or maybe some fine jewelry needs to be sold to finance a child’s education. Divorce is another reason someone might sell jewelry. From the buyer’s perspective, they see fine jewelry as works of art, which they collect with zeal, or they’re looking for gifts for their wives or children. Clients come to us with all sorts of needs, and it’s our mission to serve them with integrity. The more we grow, the more we see that there’s immense interest, particularly among owners of jewelry, who often have no clue where to begin when it comes to selling. There’s unfortunately a lot of unscrupulous buyers out there, and most people, unless they are experts in the industry, easily lose money they deserve. When they come to us, we teach them how jewelry is evaluated, in what ways they can maximize their earnings—and if they want, help them sell it through auction. We are the world’s only no-fee fine jewelry auction house. While other auction houses typically charge a seller’s commission of at least 10% off the hammer price, we don’t charge the seller a dime—not even the fees for photography, cataloging, marketing, or unsold lots. Our profit is derived from the buyer’s premium, which is on par with the industry standard. This way, the seller has nothing to lose and everything to gain by consigning with us. Because we have such a narrow focus in our operations, we are able to keep our overhead lower than a traditional auction house and we pass along those savings to our clients. In addition, we offer free valuations. Anyone is welcome to submit photos of their jewelry or visit us for a consultation, free of charge, and with no obligation to consign thereafter. In the United States, the auction industry is dominated by a duopoly consisting of Sotheby’s and Christies. Most people who are aware of auctions know these two names. However, the kind of items most people own wouldn’t meet the quality/price point standards for these auction houses since they must operate on such a large scale. Then, on the other end of the spectrum, are small, local auctions. They are wonderful; often warm and easy to work with. But they also have limited reach in terms of finding a buying audience. Fortuna is run by a small and dedicated team, but working in the realm of higher-end jewelry, so in my eyes, we offer the best of both worlds. What’s a view you held before starting your business that has since changed? I used to think that starting a business required a picture-perfect business plan. A common concern among entrepreneurs is finding the perfect position in an already crowded industry. But the longer I work on my business, the more I realize that it’s about people. Clients don’t come to you after a doing a lengthy market positioning analysis, and determining that you’re the smartest. They come to you because they trust you and like you. So don’t think that you’re just another Italian restaurant among a sea of Italian restaurants. If you put your heart into it, have a product or service that truly serves the public, you’ll succeed as long as you treat people with consideration and respect. To find out more about Fortuna please visit Fortunaauction.com.